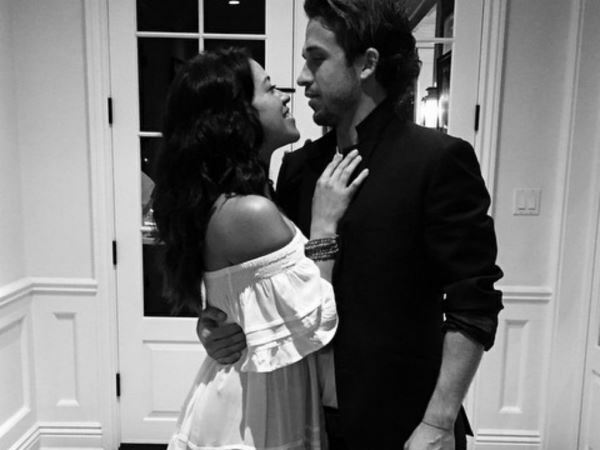 Gina Rodriguez prays for “100 more” anniversaries with her boyfriend. The Jane The Virgin star has been dating Henri Esteve for the past 12 months. And as the pair marked their one-year anniversary on Thursday, Gina took to her Instagram page to tell fans just how much she loves her beau. “It's you. It's always been you. One year down, I pray for a 100 more. Happy anniversary my love. @H_Esteve (sic),” Gina wrote. The star’s touching message accompanied a picture of herself wearing a stunning off the shoulder white dress with her arms wrapped around her boyfriend while he gazes deeply into her eyes. It's you. It's always been you. One year down, I pray for a 100 more. Happy anniversary my love. Despite choosing to take her sister as her date on the red carpet at the Golden Globe awards earlier this year, Gina has never made a secret of her feelings for Henri. And she said the fact he is an actor as well means he understands where her priorities lie. “He's gorgeous! And he's talented! And he's a really, really good guy!" Gina told E! News. "I just know that I have a very strong and supportive boyfriend. He's an amazing artist himself who respects the craft… He supports me and I think that's all that matters. We're very honest and there's a lot of communication. He knows that my priority is Jane and him and family." I'm an open person looking for my friend,brother a person who will be my everything all the time. I'm a 23 year old woman looking to meet men between the ages of 23 and 35.